Lush green tropical vistas. A soaring mountaintop. Crystal blue waterfalls and golden beaches... Thunder-Rock Island is a sight to behold, yet it seems utterly deserted. People come to Thunder-Rock Island for many reasons, but few reasons are worth the danger of going. The large island seems to be populated solely by dinosaurs; large scaly beasts of generally nasty disposition. Many resources that have been stripped from other islands can still be found in abundance here as the island is bountiful and the dinosaurs prove an effective deterrent. Rare herbs, and outcroppings containing valuable gems are easily stumbled upon but not so easily left with. Others come for the dinosaurs themselves. A dinosaur raised from birth can be trained to be an effective companion, and the small compsognathus is sought after for efficient pest/waste management. The raptor eggs are highly sought after, especially by druids and rangers seeking intelligent and deadly animal companions. There are rumors of a sect of druids that live deep in the interior of the island and tame even mightier beasts, but if they do exist they are not fond of conversing with outsiders. A small amount of people attempt to visit the island simply for the sake of knowledge, ironically the most foolish of the lot. This primordial bead of life was not meant to be studied or tampered with, it only means to survive. This beach map can be used to introduce players to the island where they face several territorial dinosaurs in a battle for higher ground and whatever else they may have came for. The ill-tempered iguanodon does not take kindly to being cut off from the game trail so near the edge of the deadly jungle, but also is not eager to run to the top of the cliffs where two pachycephalosaurs are locked in a heated head-butting duel likely to knock one another off of the seaside cliffs. Further along the trail, a stubborn ankylosaurus is trying to get a cool drink despite its fear of the water. Besides, there are nesting pteranodons just ahead and it is not keen on bothering them again. All the animals stay clear of the jungle, there is only death there. Under the leafy canopy raptors (deinonychus) patrol the treeline looking for easy prey and defending their precious nests. Using dinosaurs statistics from pathfinder beastiaries, this is a suitable adventure for characters level 6-7. Congratulations, Max. Putting yourself out there to compete in anything is hard, and designing RPGs is hard. Particularly designing adventure settings or locations. You have to be able to suggest some ideas about personalities, plots, terrain, and more, and have GMs chomping at the bit to add your location to their regular game. Let's see how you did! I believe in positive feedback and honest criticism that should make you better at every part of this gig. So to start positively, I want to say this is the most adventure-ready of the entries I've seen so far. You use the map to offer us a few dinosaur encounters so you can spend your word count on prose. A finished product would clean that up and include entries in your text for the dinosaurs, but I'm very pleased to see an entry with encounters and adventure already ready to go. Something that would help your entry significantly is for you to learn to write in active voice. Make sure your nouns are dong things instead of having things done to them. Eliminate 90% of your usage of the words "is" and "are" and almost all verbs should be present tense. This habit doesn't just make your prose smoother. It makes you a better first draft writer and puts the reader in the moment. Smoother with more immersion and reduced word count. Good luck in the contest and work on these things should you advance! You can almost never go wrong with a dinosaur-centric adventure location. You do a wonderful job of describing the dinosaurs’ activities and how they react to each other, allowing canny adventurers to use this to their advantage. The map helps in this regard by displaying the current locations of each of the dinosaurs and reinforces the detail in the text. You very clearly state the expected level range for characters, but a GM could peruse various bestiaries to come up with challenges for most CRs, while more or less keeping the dynamics between the chosen dinosaurs intact. The map goes into considerable detail about the various encounter areas. For example, I know how to adjudicate movement through the jungle. For the purposes of this design round, this works very well. 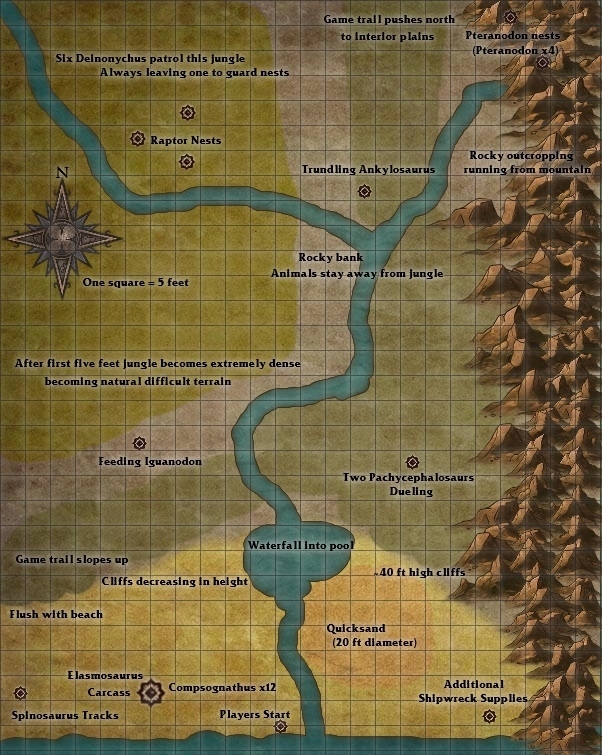 For an adventure, all the detail you placed on the map would have to move to the text as you describe individual encounter areas. The map leaves plenty of space for GMs to move encounters around to their liking. Maybe it’s because you put so much detail in your map that I noticed some missing things. For example, how deep is the pool where the waterfall descends and how tall is the waterfall? You could have done with a proofread of the text. You’ve got a couple of run-on sentences, and you often use passive voice. This takes practice, but it would behoove you in future rounds to have a trusted friend proofread your potential turnover and weed out some of these issues. Overall, this adventure location presents a vista filled with dinosaur action. The many editing glitches force me to put this one on the fence for a recommendation. A dinosaur-infested island seems like an exciting locale, but I think Thunder-Rock Island needs something more to elevate it to the next level, something that sets it apart from any other tropical dinosaur-infested island. "Jurassic Park" is exciting because we don't have dinosaurs, but in a fantasy setting where dinosaurs can be found in potentially many locations, that's not enough. Where the description tells me that few reasons are worth the danger of going, my reaction is why go there then? Rephrase that to say the riches available exceed even the huge risk in setting foot on the island, and then I'm intrigued as a GM, which means I'm going to want to use this more. The description needs to play up what makes this location special, something that a GM says they have to run their players through. Along those lines, I'm not sure the name works. Obviously naming isn't a science and what might work for one person won't for another, but this feels almost like a parody to me. When I hear Thunder-Rock, my brain goes to Thunderdome and I get to cheesy, over-the-top '80s images instead of what I think the name was going for. I do really like the last paragraph, and the introduction of the map. It's clear what it's there for and what's going on on the map. The reference to the rulebooks, however, should be capitalized (and typically italicized), and Bestiary is misspelled, which is the type of attention to detail it's important not to miss. But I think unfortunately after that, the map has some problems. It's not immediately clear to me what each color is meant to be; what's the difference between the darker green and the grey? I'm not sure what exactly indicates the 40-ft. cliffs and where the demarcation is between beach and cliff, beyond what I can extrapolate based on where the waterfall is. I think I would have to get a lot of clarity from the designer for the cartographer to turn this into what the designer wants to see. Based on the map and the 5-ft. squares, it arbitrarily puts the PCs 25 feet away from what should be a Huge carcass (though that only takes up a 5-foot square), and it's not quite clear why the PCs might have chosen to start there. All in all, I'm afraid I think there are a few too many problems with this entry. I do not recommend this to advance. Nice work on making it through Round 2. First, I think this map is very well done for submitting to a cartographer, for the most part. As motteditor pointed out, the descending cliffs and elevation coloration doesn't make it easy to tell just how smooth or sheer the ascent/descent should be. I think that largely it would only require a few lines of clarification. Second, from an exciting encounter location, this fits the bill. You have flying enemies, you have difficult terrain, you have tiny creatures as well as big ones. You have cliffs to climb and quicksand to avoid. As mentioned, a note on the depth of the pool or quicksand might handy (to adjudicate their effect if some of the larger beasts move through or are lured into those areas). At its base, your map covers the location you specify and why the PCs might be there. While ultimately an adventure using this might use area numbers to delineate encounters, your map and description of the placed creatures gives more than adequate information to adjudicate their reactions to intruders and their goals or objectives (ie. eat them, keep them from nests, etc.) Also, I feel that the addition of the elasmosaurus carcass reinforces that the dinosaurs aren't restricted to the island itself (even with flying dinosaurs the island might be thought to be too far from other islands for travel). This reminds PCs that the waters aren't necessarily safe havens.